Sorry this is so dark - it is SO hard to photograph sparkle! White Card Base, Square, 5 1/4" x 5 1/4"
I was impressed with the amount of items in the kit, The contents are all laid out here AND on the same page you will find 2 videos, put out by Cheery Lynn, explaining these cards. It just could NOT get any easier if they made them for you! I'm already thinking about which kit I'm going to get next. Since I like to stretch my supplies, I'm leaning toward the birthday cake kit, I think it'd be fine as a wedding cake; all you'd have to do is lop off those candles and you could make it any kind of cake you wanted! And they are calorie free! I started my card with a square white card base; I knew I wanted to use silver as my other color so when I found a nice piece of silver card I attached that to break up the endless white. That also helped me figure out where I was going to add my shaker element. Anyway, I had reservations about the foam cutting through and exactly what sandwich combination to use with my Big Shot (I have old base plates - they rarely show up on instructions anymore, but they work fine, so why spend money on them when I can get more dies?) but I ran the foam through my machine like I normally would; I even used the Tutti metal adapter plate and the foam went through just fine. I have to say, if you are a serious die cutter you absolutely need one of these plates! I've seen lots of different ways to ensure your die cut will cut properly and cleanly and I haven't had to ever use anything else once I purchased my metal plate. It's glorious! OK, back to the card. I basically followed the directions on the package, which just explained, step by step, how to make the card. 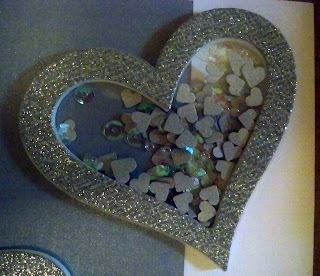 I cut my shaker heart out of silver glitter paper, then cut the acetate (the acetate in the kit has blue protection paper on both sides that must be removed prior to cutting; I cut a shape out of the acetate unused portion of the sheet open to marking.) So I had my foam, my heart shaped front and my acetate. acetate. You decide on your card where you want the shaker portion to be and stick your foam cut out there. Next was filling the shaker before you seal it up. 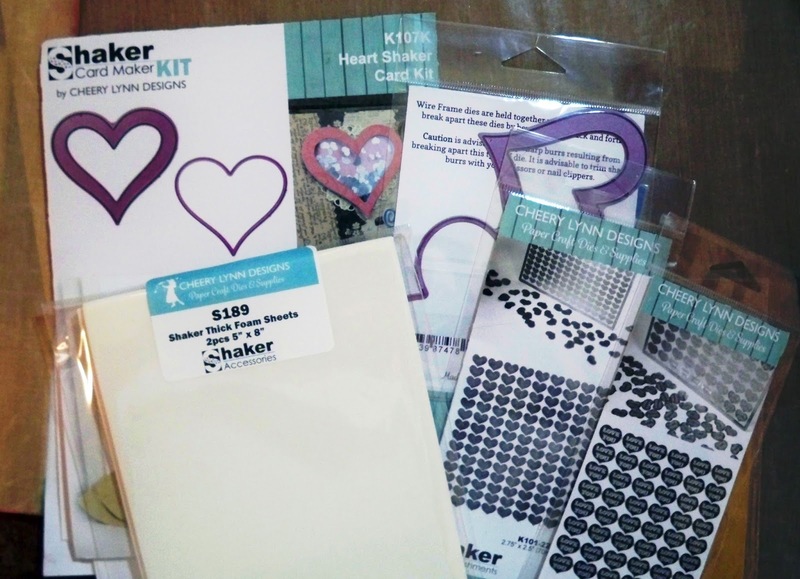 The kit comes with 2 shaker filler options called "Shaker Mini's", they are essentially teeny little die cuts that you make using special little embossing pads that come with the kit (or, there are many you can buy separately as well to make your shaker confetti). You might have noticed I didn't use the product of the Shaker Mini in my card, basically because when I attempted to die cut the little hearts the entire thing broke apart and was useless. Now, I have emailed the company and explained what I did, I'm sure it was something I did wrong, and I am waiting for them to reply. My point is, be careful with those Shaker Mini's, they are somewhat fragile! 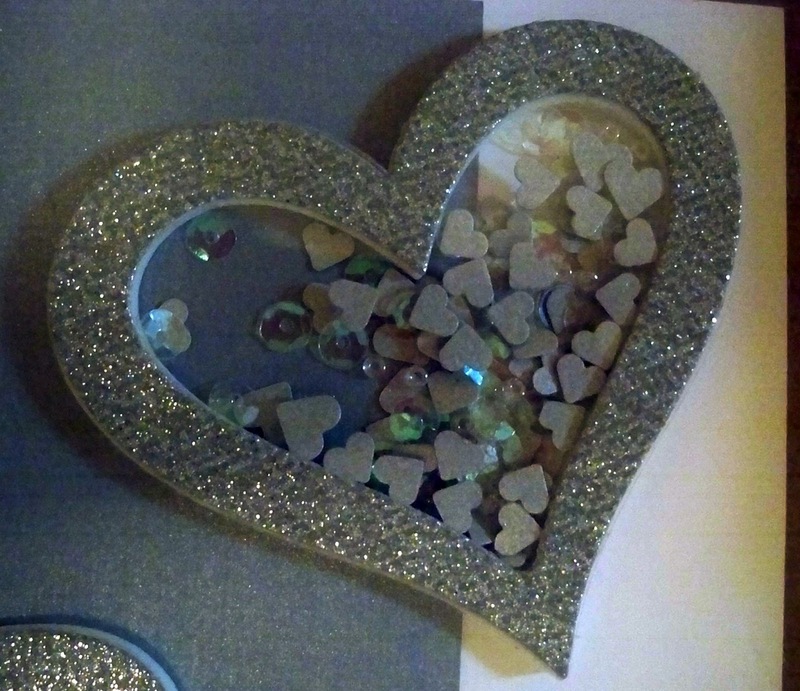 I just punched some teeny hearts out using a hand punch, then added a few small beads and sequins. very top. I had leftover "inside" foam and glitter paper cut out, so I popped that together and added it to my card. I die cut the sentiment from white glitter paper, placed it over the silver paper and trimmed the tail so the word would fix properly. Lastly, I scattered some of the sequins I used in the shaker mix around on the left corner and at the end of the sentiment. What a great idea! Love the simplicity of your design! Thanks for all the wonderful details!! I struggle with shaker cards so this was very informative! Awesome! Wow! 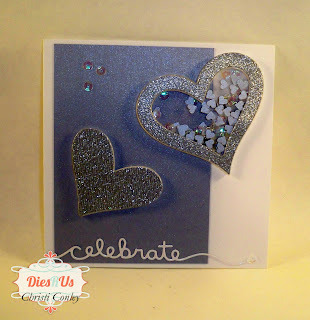 Every time I think that I have seen all of the available dies at the Dies R Us store, someone makes a great card like this and I think..... why didn't I see that one. Another kit on my wish list. Thanks Christi, for all,of the details on your card. I agree with Barbara! I LOVE your card and now I must go put some shaker card dies into my wish list! Beautiful card, Christi! 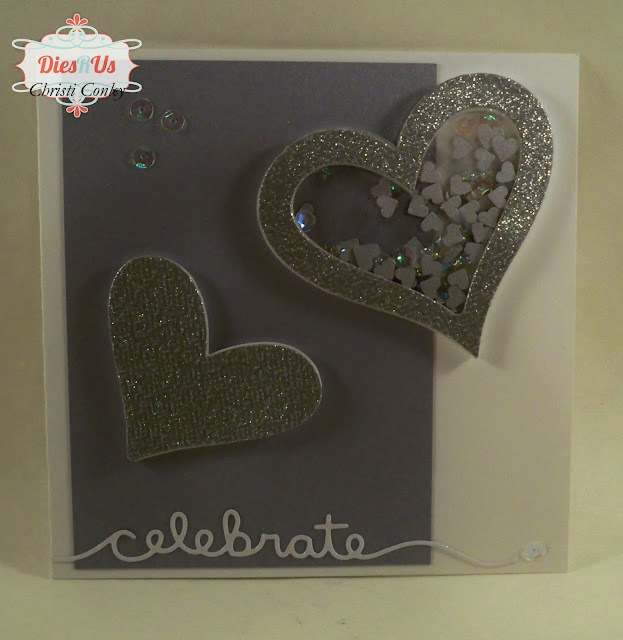 This is an awesome shaker card with those little hearts. I need to check out this die also. This is so stunning and I love that it's a shaker card too!